Intra day, the Sensex hit an all-time high of 37,931 and Nifty touched 11,459 level for the first time. Market heavyweight Reliance Industries added 2.85% or 35 points to close at 1217 level . The stock touched a fresh 52 week high of 1222. 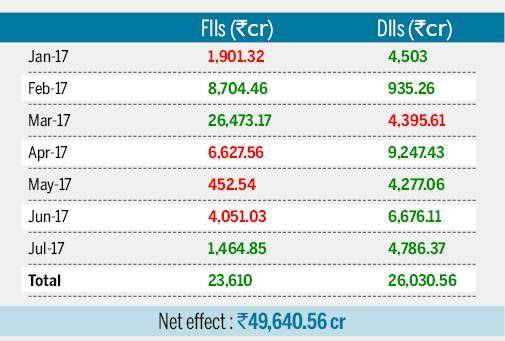 The market closed at record highs today powered by a surge in banking and consumer durables stocks. While the Sensex closed 221 points or 0.59% higher at 37,887, the Nifty gained 60 points to close at 11,450 level. Intra day, the Sensex hit an all-time high of 37,931 and Nifty touched 11,459 level for the first time. Market heavyweight Reliance Industries added 2.85% or 35 points to close at 1217 level . The stock touched a fresh 52 week high of 1222. Other Sensex gainers were ONGC (2.87%), ICICI Bank (1.63%) and SBI (1.53%). Vinod Nair, Head of Research at Geojit said, "After a muted start, market scaled to new high on account of increase in FII inflow and in line quarter earnings. Strong domestic triggers will continue to add room to outlook, whereas factors like volatility in oil price and rupee may delay the pace of rally. Global markets were mixed as investors continue to stay cautious due to lingering concern on US trade tensions." Banking stocks led the charge with the Bank Nifty closing above 28,000 level for first time. BSE bankex too rose 245 points or 0.78% to close at 31587 level. Consumer goods stocks too contributed to the rally with a 271 points or 1.25% rise in trade today. "Markets are ignoring the developments shaping the US-China conflict, because in the results seasons in the large-cap category, there are more hits than misses and they are actually supporting the markets," said Saurabh Jain, assistant vice president of research, SMC Global Securities. Maruti Suzuki was the top Sensex loser falling 1.99%. However, market breadth was negative with 1,315 stocks closing higher compared with 1422 stocks falling on the BSE. B Gopkumar, Executive Director and CEO at Reliance Securities said, "The Indian equity market scaled to an all-time high to close at 11,450 levels, up 60 points on back of buying interest witnessed in key sectors like energy, banks and IT. While the select sectors outperformed the broader market, the mid-caps and small-caps index continued to underperform." "We see the momentum shifting to mid-caps and small-caps sectors as lot of quarterly results are awaited which will give insights on the current year earnings. Among the BSE 500 index, 325 companies have announced Q1FY19 numbers with revenue growth at 17.5% and profit growth at 6.5% on a y-o-y basis. We continue to remain positive on the markets but going ahead we expect some consolidation in the market after a sharp rise in the index that has gained nearly 7% in the last 5 weeks, " he added. 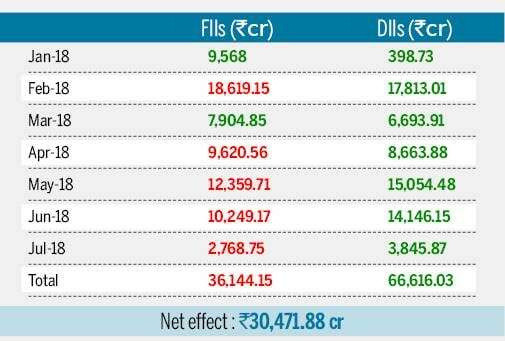 Meanwhile, FIIs purchased shares worth Rs 314.83 crore on net basis on Tuesday, while DIIs sold shares worth Rs 319.9 crore. Shares were mixed in Europe and Asia on Wednesday after the U.S. followed through with plans to put higher tariffs on $16 billion in Chinese exports. Britain's FTSE 100 gained 0.3 percent to 7,737.56. In Germany, the DAX slipped 0.1 percent to 12,636.05 and the French CAC 40 lost less than 0.1 percent to 5,518.64. The future contract for the Dow edged 0.03 percent higher to 25,607.00 while that of the S&P 500 was flat at 2,859.50. Japan's Nikkei 225 index gave up early gains to fall 0.1 percent to 22,644.31 and the Shanghai Composite index fell 1.3 percent to 2,744.07. Hong Kong's Hang Seng index added 0.4 percent to 28,359.14. Australia's S&P ASX 200 climbed 0.2 percent to 6,268.50 while South Korea's Kospi edged 0.1 percent higher to 2,301.45. India's Sensex climbed 0.4 percent to 37,802.19. Shares rose in Thailand but fell in Indonesia and Singapore.